"Is this how it ends?" "Romdo is doomed. I've always hated this city." As before, this review assumes you've seen the preceding volumes of Ergo Proxy, or at least read our previous reviews. I'm making no concessions to newcomers here, and if that includes you then you might want to follow the links in the right-hand column and check out the reviews of earlier episodes if you're to make much sense of the following. Unlike the linked single-story structure of previous volumes, this final collection plays more as a feature-length episode broken into three parts, with mid-scene pauses for closing credits and none of the stylistic diversions of before. It kicks off with our separated trio of travellers already back in Romdo, a city now in the late stages of self-destruction. The cogito virus has infected almost all of the city's AutoReivs, an outbreak of self-awareness that has left them locked in positions of prayer, making them easy targets for the band of armed immigrants who have taken it on themselves to save the city by eradicating this perceived menace. Inspiration for their task is provided by the arrival of Re-l, whom they regard are their rightful leader, but the focus of her attention is the fallen-from-grace Daedalus, whose obsession with Re-l has resulted in the creation of an angelic doppelganger named Real Mayer. Vincent, meanwhile, is in proxy form and still being hunted by Raul Creed, but things complicate for him when he is brought face-to-face with another proxy of mysterious identity. Let's cut to the chase – volume 6 of Ergo Proxy is, at least in comparison to what has gone before, a disappointment. It certainly brings the narrative to a climactic conclusion, but in a manner that lacks the complexity and leftfield invention of the previous volumes and whose final revelations do not deliver on the anticipation created by the 20-episode build-up. Revealing any more of the plot would spoil what surprises there are – we do, after all, find out who Vincent really is, although the fine detail of this almost becomes lost in one of the series' least compelling philosophical discussions. On the plus side the tone of unbroken fatalism feels utterly appropriate to the story's conclusion and the show looks as good as ever, with the artwork and animation of Re-l some of the best so far. Opportunities for potentially fascinating story threads are passed by, with the destruction of Romdo playing as background action, while precious little is made of the continuing virus-induced humanisation of Pino, whose condition is outlined in uncharacteristically state-the-obvious manner by Raul Creed's AutoReiv Kristeva, a character who starts to get interesting just as the series ends. 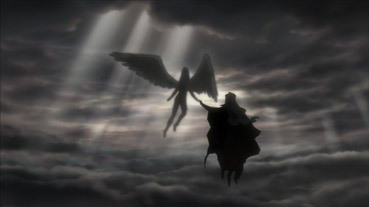 More surprising, particularly for a Japanese science fiction anime, is the drift into Christian imagery and mythology, with philosophical discussions on the work of 'the creator' echoed by the multitude of praying AutoReivs and a late-story image of Vincent and fellow proxy Monad ascending to (a presumably symbolic) heaven. For series regulars there's still enough here to hold the interest, but this is one of those times when it's best not to set your hopes too high, not easy given the quality of what has gone before. 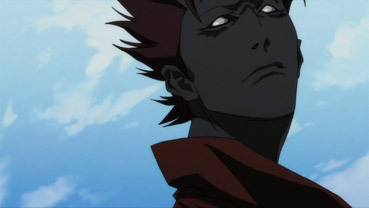 Ergo Proxy remains an extraordinary example of recent anime at its most challenging and intellectually exciting – it's just a shame it concludes in relatively unremarkable fashion. The episodes here are, with the alternative/translated titles in brackets, Shampoo Planet (Place at the End of Time), Bilbul (Bind) and Deus Ex Machina (Proxy). The standard of previous volumes is maintained here, and this time round there are no brightly coloured exceptions to the dark look rule. Detail is good and there are no obvious compression problems in areas of single colour. The soundtrack quality is impressive, with the sound effects in particular having excellent clarity and bass on both the Japanese and English 5.1 tracks and the virtually identical English DTS track. Re-l's gunshots have considerable wallop, and the lower frequencies really kick during the destruction of Romdo. As ever it's all down to personal choice whether you go for the original Japanese track or the American English dub, but I still rate the Japanese track far more highly – check out the voice of Daedalus, which on the English language track is obviously male (an adolescent American male no less), shattering the character's otherwise androgynous intrigue. Given that there are only 3 episodes here instead of the usual four, an extra feature or two would have been appropriate, but all we have are the usual promo trailers for other MVM releases, which I don't count. A disappointing ending to an otherwise excellent series whose complexity and ambition should have delivered a final act that made our heads spin. Ergo Proxy completists will want it anyway, as they should, but with one less episode on board and no extra features I'm tempted to suggest you wait until the price drops a bit.